The Bespin Wing Guard, informally known as the Bespin Security Guard, Cloud City Wing Guard, or Cloud Police, whose members sometimes were called Bespin cops, was the primary security force of Cloud City on Bespin. b. Only the turtleneck collar of the undershirt is exposed. h. Jacket bottom is below the waistline and covers the waistline of the pants. 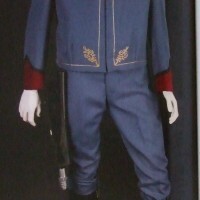 NOTE: The Jacket, Pants, and Helmet are a dark blue (not navy) in color and should match as closely as possible. Since the Helmet is a suede like material it might be easier to purchase cream, white or ivory fabrics and then dye them so they all look the same. c. It is preferred that the boots have a visible full-length inside zipper with either a brass or gold colored regular zipper pull – however pull on boots will be permitted or smaller inside zippers. No laces or buckles allowed. a. Accurately shaped helmet based on the Ottoman Turkish Kabulak but worn backwards to create the very short visor effect. Material of hat should have a suede like appearance and match the jacket and pants in color. The helmet design is made from 2 belts. Each belt is made of a right and left side. The right and left sides overlap on the top belt in the opposite direction as the bottom belt. The bottom belt sits on top of the upper belt. b. Belts have a dark blue trim on the edges which are visible and make the design of the hat. 1. Relby K-23 Blaster Pistol in accurately shaped black plastic holster. Holster may be worn on the right or left hip.